Attendance is taken at each class. Please make every effort to attend your classes and to arrive on time or a few minutes early. 2019 Summer Camps: This Information goes home in March. Ballet and Tumbling: (Age 2 1/2) This 45 minute class is a great way to introduce your little ballerina to dance! A combo class of Ballet and Tumble. Ballet shoes are needed for this class. Ballet and Tap: (3 and up) Beginner-Intermediate 1 hour class. Its a great combo class of Ballet and Tap combined with technique and those tappin feet! Ballet and Tap shoes are needed for this class. Beginner Jazz and Tumble: 1 hour class: Is designed for our fast little movers! Teaches the basic moves of Jazz Technique and our Basic Tumble skills for coordination. Jazz shoes are needed for this class. 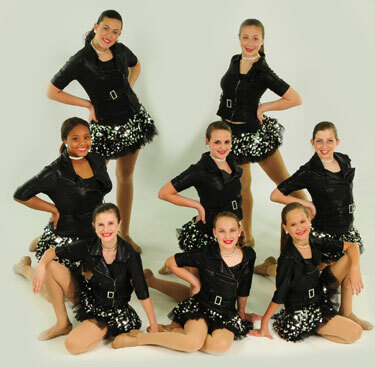 Ballet, Tap, and Jazz Combination Classes: Ballet, Tap and Jazz Combination classes are available in All Levels. All three techniques are taught in this class. This class can be a 1 hour/15 minute class or 1 hour/30 minute class depending on the level. Ballet, Tap, and Jazz shoes are needed for this class. Lyrical: Combination between Ballet and Jazz combining technical elements. Tan Jazz shoes are needed for this class. Hip Hop: A fast paced, high energy class for our dancers who like to move! Floorwork and tricks are taught in this class. T-shoes and Jazz shoes are needed for this class. Advanced: Back walkovers, Front walkovers, Back handsprings, and Tumble sequence passes are taught in this class. No shoes required for this class. Requirements for Opening the Show: To be selected for the opening number by Miss Brandi, you must take ballet, tap and jazz on certain levels. The Foundation of Dance: We recommend that each child take a ballet class in addition to any other classes they wish to take. Parents please remember, Ballet Class may not be your child’s favorite class but is the key to every type of dance.